Hey everyone, today we’re going to be taking a pretty epic look at the 25 most popular Seiko dive watches available for men. 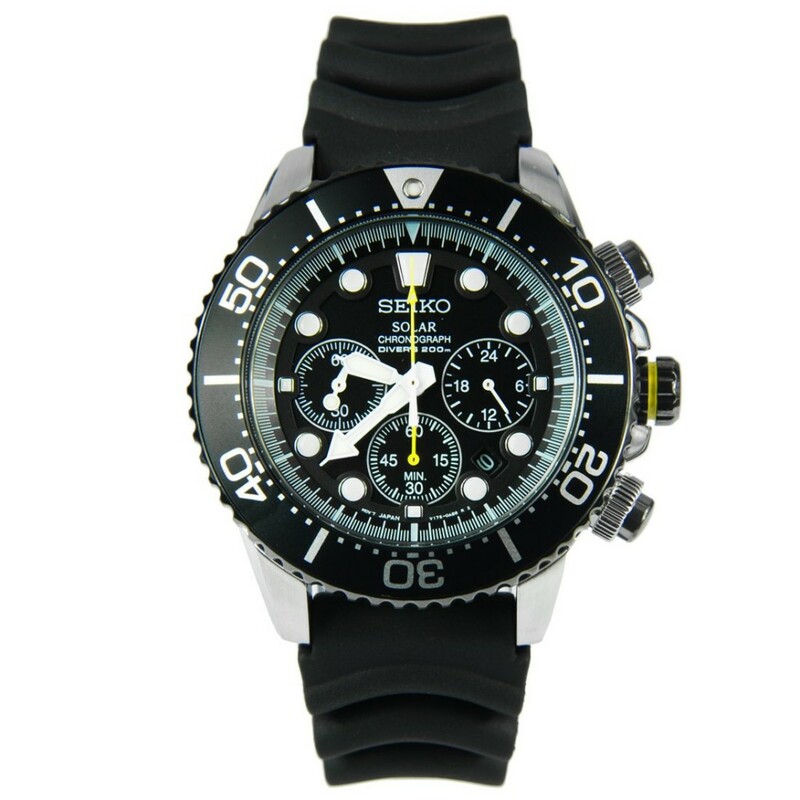 These are all among the best selling diving watches available due to their high quality and very competitive pricing. 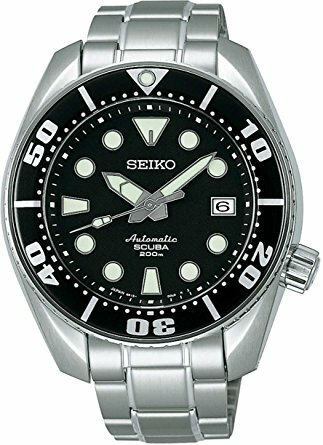 When it comes to the best diver under £500 Seiko are a common sensible choice. There’s a wide selection of styles available with a varying degree of water resistance rating. So whether you’re after a normal 100m rated timepiece or need something with an ISO 6425 certification like a diver’s 200m rated timepiece then there’s something here for you. For more details on water resistance ratings check out this wiki. Obviously, where there are slight variations of a model with an alternative strap I’ve tried to avoid repeating a watch and instead added in the alternate versions in each watches little snippet that I’ve included. As is common with diving watches, many of these watches features high visibility dials that include LumiBrite technology which offers excellent visibility in dim lit conditions. 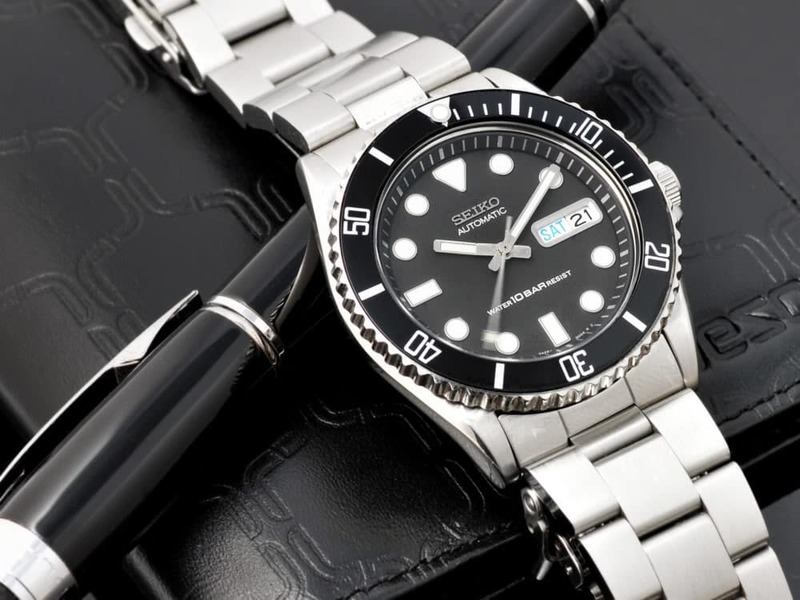 I hope you enjoy this look at the best Seiko dive watches, as always let me know what you thought in the comments section below. 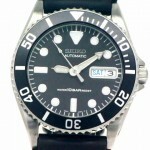 The first watch to be featured in our list of the best Seiko diver’s watches is the Seiko SNZF15. This is known as the Seiko Sea Urchin or Seiko Mini Sumo. It’s a 41mm automatic watch that features the popular 7S36 caliber movement. It has a Pepsi style bezel with the instantly recognisable red and blue finish. This model is part of the Seiko 5 series which are known for their value for money and good build quality. 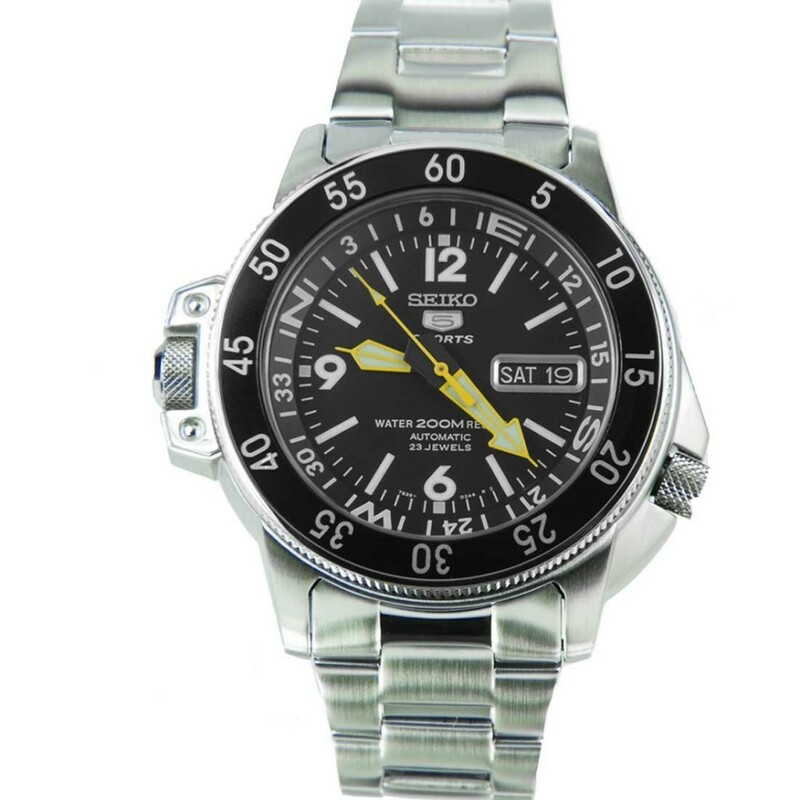 The Seiko SNZF15 model has a standard stainless steel strap. If you prefer a rubber strap you could check out the Seiko SNZF15J2 variation. Other variations include the Seiko SNZF15K1, Seiko SNZF15K2, Seiko SNZF15J1. You can read my full Seiko SNZF15 review here. Next up we have the Seiko SKX007. 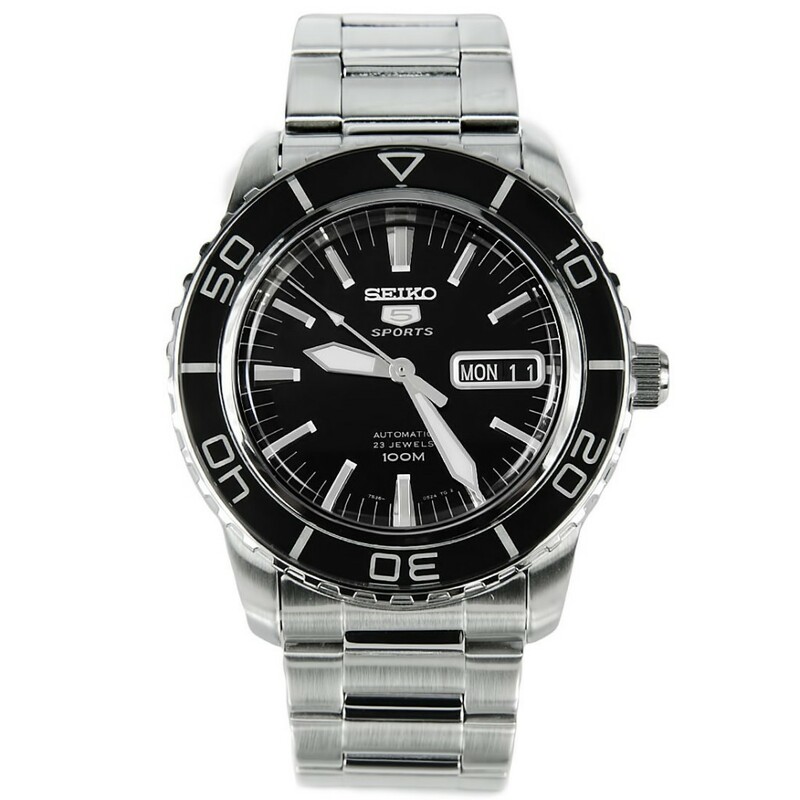 This is another one of the best Seiko dive watches currently available. It’s a 43mm watch that runs on an automatic 7S26 movement with a 43 hour power reserve. Of course, a key feature of this model is the diver’s 200m water resistance rating. The display features these bold hands and hour markers that are coated in a good amount of lume for easier reading in dim lit conditions. You can read my full Seiko SKX007 review here. Here we have another Seiko divers automatic watch. The Seiko SKX013 looks in essence very similar to the Seiko SKX007. It’s actually noticeably smaller with a 38mm diameter instead of the 43mm of the SKX007. This model also runs on a Japanese 21 jewel 7S26 automatic movement and features a very impressive diver’s 200m water resistance rating. Easily rated as one of the best Japanese watches when it comes to diving timepieces. If you prefer a stainless steel strap you should have a look at the Seiko SKX013K2 which features the Jubilee style strap. Alternative names for the rubber strap version include the Seiko SKX013K. You can read my full Seiko SKX013 review here once it’s ready. 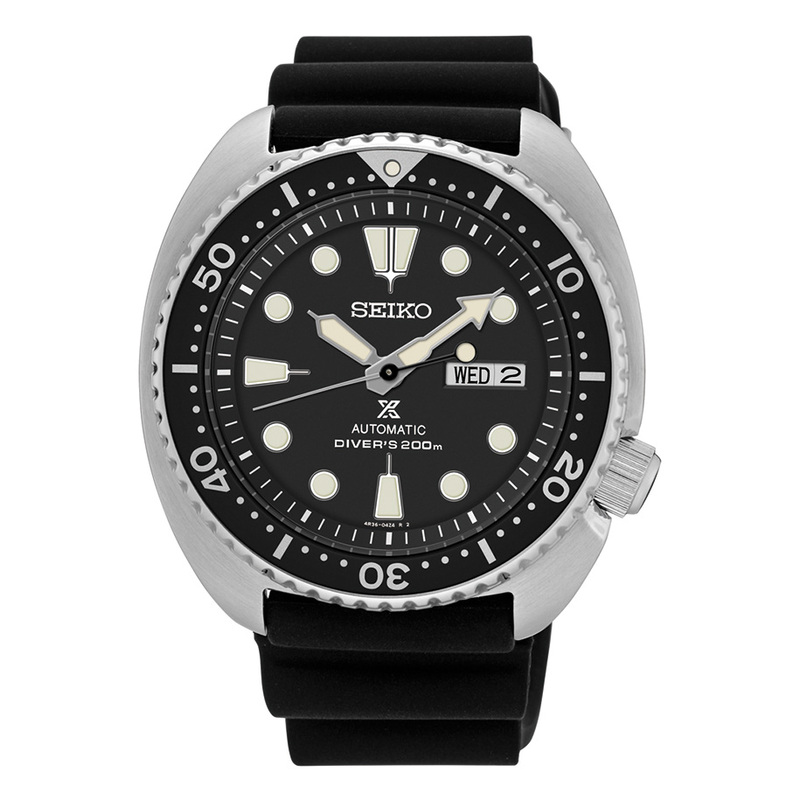 Next up in our list of the most popular Seiko automatic dive watches is the Seiko Turtle or SRP777 as it’s coded. The Seiko Turtle features this interesting casing design that measures 44mm in diameter with a 14mm thickness giving it a nice chunky profile. This model features an automatic 4R36 movement, this is self winding mechanical movement that features manual winding as well as the ability to be hacked. It beats at 6 ticks per second (21,600 BPH) giving it a nice smooth movement. It’s another Seiko that’s suitable for scuba diving with a Diver’s 200m water resistance rating. This is the Seiko SRP777 that features the rubber strap, there’s a slight colour variation with a metal strap which is the Seiko SRP775K1 that may be worth checking out too. 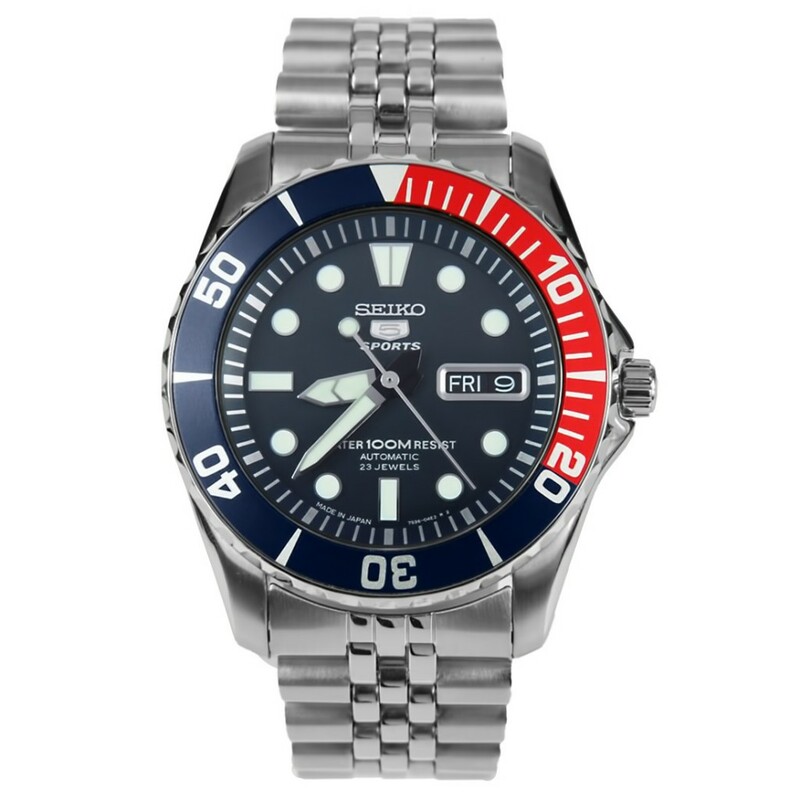 If you like the look of this model but perhaps want to see it with a Pepsi style bezel then check out the Seiko SRP779, also known as the Seiko SRP779K1. You can read my full Seiko SRP777 review here once it’s ready. 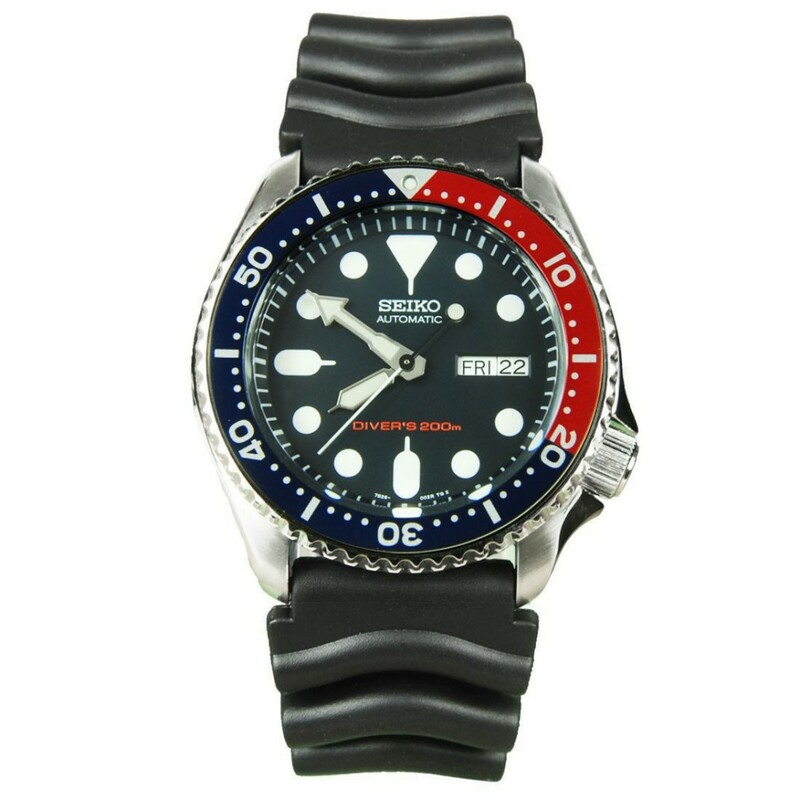 The next Seiko dive watch we’re featuring is the very popular Seiko SKX009 with the Pepsi style bezel. This model with the rubber strap is known as the Seiko SKX009K or Seiko SKX009K1. This model has a 43mm casing diameter with a 13mm thickness making it a pretty decent size for a diving watch. The dial features these bold easy to read hour markers and hands which are coated in a good amount of lume to make it extra visible in dim lit conditions. The Seiko SKX009 runs on a Seiko 7S26 automatic self-winding movement. 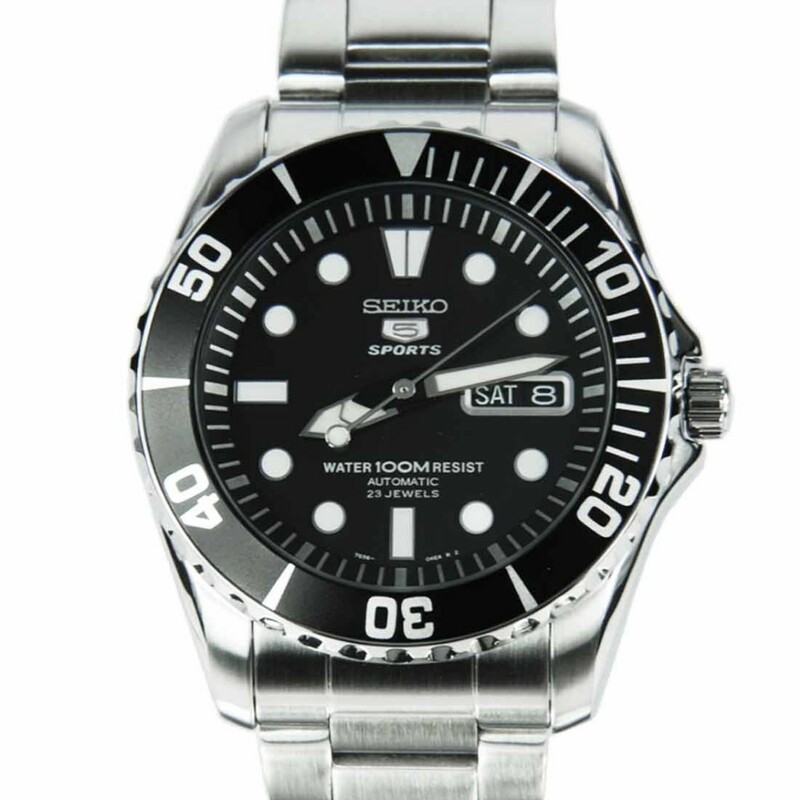 As you’d expect from the best seiko dive watches, this model has a diver’s 200m water resistance rating. The Pepsi bezel is what makes this model stand out the most, if you like the look of it but prefer, say a stainless steel strap then you should check out the Seiko SKX175 or the Seiko SKX009K2. You can read my full Seiko SKX009 review here. Another popular Seiko diver is the Seiko SNZH55K1. This is a decent Seiko diver with a 41mm casing diameter. It runs on the popular 7S36 caliber movement that can’t be manually wound or hacked. The model has this nice black design to the dial and I like the look of the chunky bezel too. This model has an exhibition caseback that allows you to take a look at the inner workings of the watch. 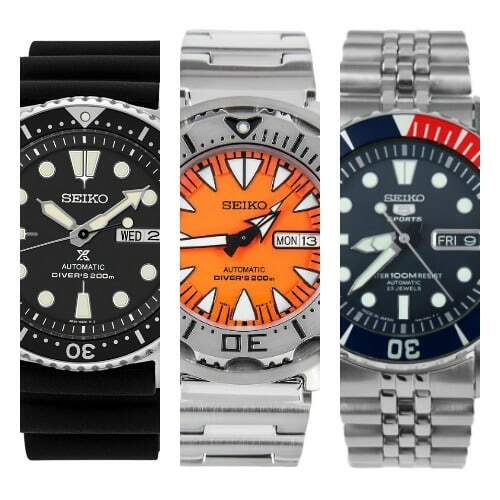 When it comes to water resistance rating it’s not as high as some of our previous models featured in this list of the top Seiko divers. It has a 100m rating which isn’t a bad thing, it’s just not diver’s rated like the others. You can read my full Seiko SNZH55K review once it’s complete. Here we have the Seiko SNZF17 or Seiko SNZF17K1 as it’s also found. 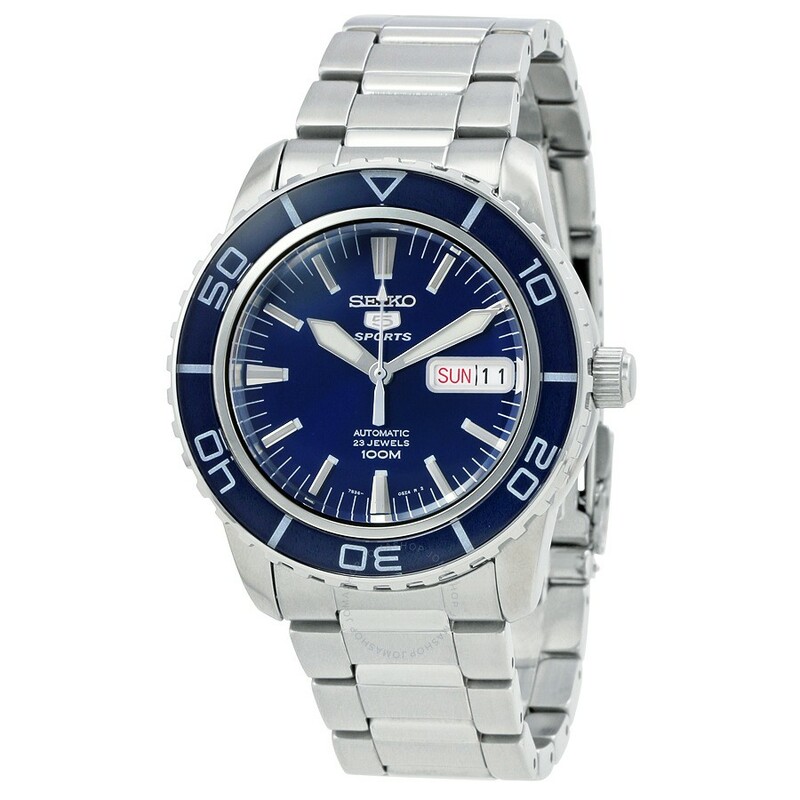 This is another watch known as the Seiko Sea Urchin or Mini sumo. It has a 41mm casing diameter and features a automatic 7S36 self-winding mechanical movement. It’s a variation of the first watch we featured, the Seiko SNZF15 but this time without that Pepsi bezel. This watch also has a 100m water resistance rating and comes from the extremely popular Seiko 5 series which is known for offering brilliant value for money. You can find a variation of this model with a rubber strap, the Seiko SNZF17K2 or Seiko SNZF17J2 depending where it’s built. You can read my full Seiko SNZF17 review here. 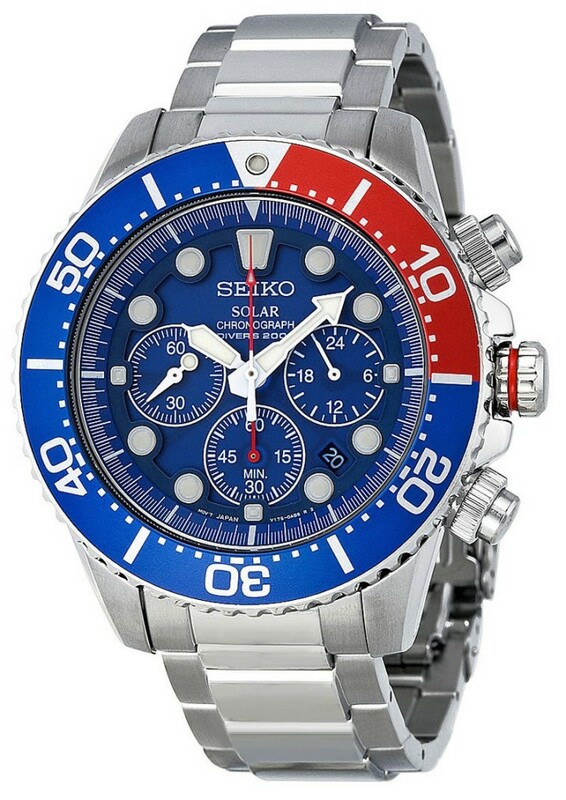 This is a Seiko solar dive watch that’s proved to be extremely popular. This model runs on a V175 solar movement that has a 6 month power reserve and features hacking. It’s a chronograph dive watch with a 60 minute and 1/5 second display. Seiko’s solar powered dive watches are popular as they charge up using the power of light and never requires a battery change, which for diving watches can often be expensive. This model has a diver’s 200m water resistance rating which is excellent to see as it will be suitable for most peoples needs. You may also spot this listed as a Seiko SSC017P1 on occasion. You can read my full Seiko SSC017 review here. Here we have the Seiko SNZH53 which is a colour variation of watch number 6, the Seiko SNZH55. It’s a 41mm Seiko diver that runs on a 7S36 automatic movement that can’t be hacked or manually wound. The watch features this brilliant blue design to the bezel and dial that I personally prefer over the black variation. It’s another Seiko 5 diver timepiece so you know you’re getting that value for money and great build quality. It has a 100m water resistance rating, a day and date display at the 3 o’clock position, and lume coating the hands and hour markers. You can read my full Seiko SNZH53 review here once it’s ready. The Seiko SKX173 has quite a lot of similarities to the Seiko SKX007. Some of you may have noticed the variation on the dial though, this model has squared/rectangular hour markers instead of dots. It’s a 43mm Seiko that runs on a 7S26 21 jewel automatic movement. This model is Diver’s 200m rated and meets the ISO standards suitable for scuba diving. The Lumibrite hands and markers make the watch very easy to read in dim lit conditions. You can read my full Seiko SKX173 review here when it’s complete. 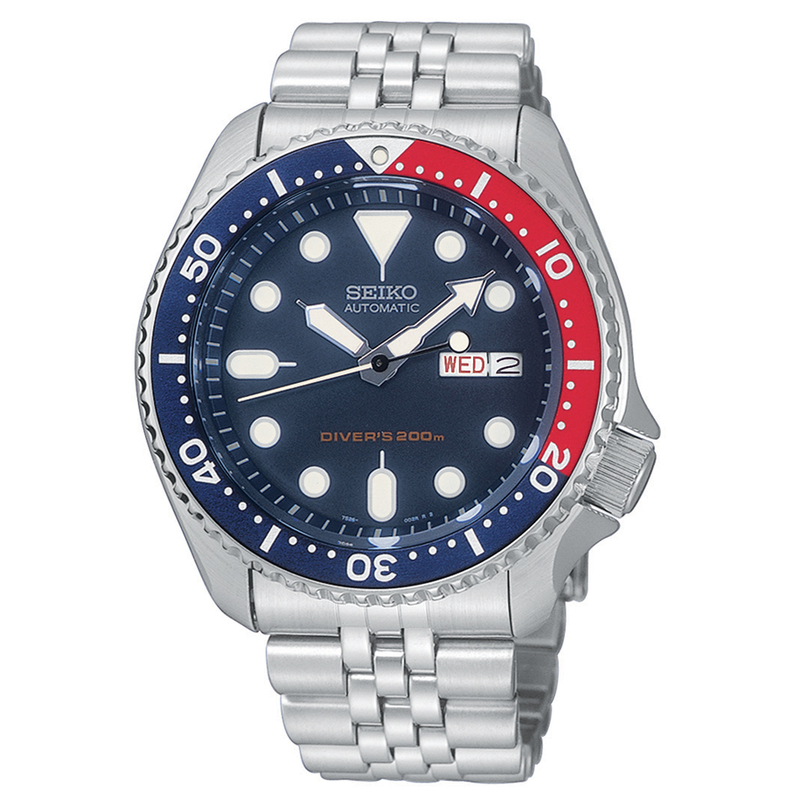 Earlier on I mentioned the popular Seiko dive watch the SKX175 with the Pepsi style bezel. This is a 43mm Seiko with a sturdy stainless steel strap. It features a Hardlex crystal glass and runs on a 21 jewel 7S26 automatic movement. Like many of the other top quality dive watches features this model has a diver’s 200m water resistance rating. 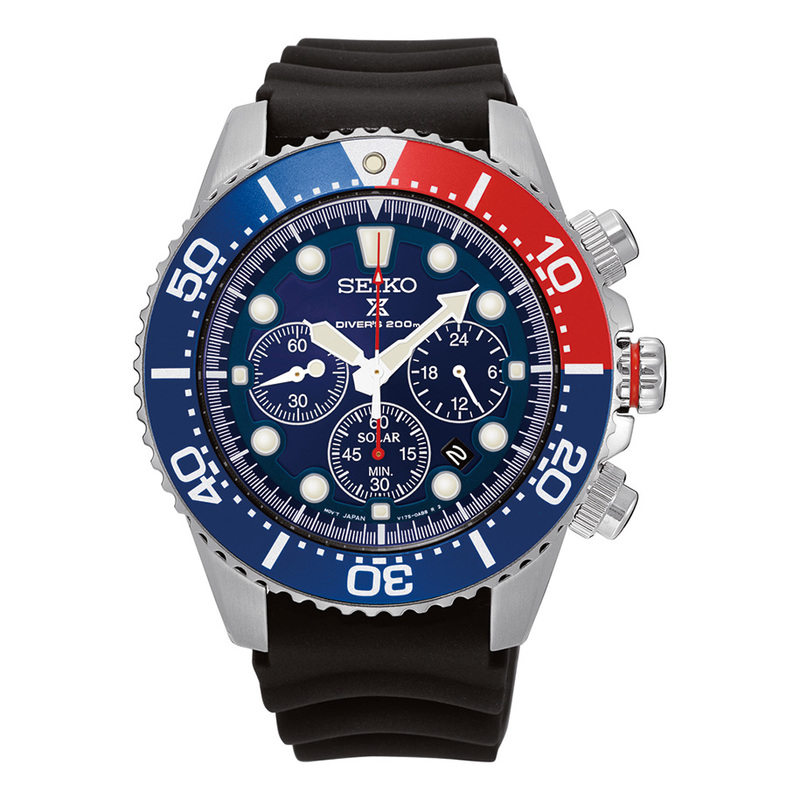 This is another one of the best Seiko Solar diving watches available and features a Pepsi style bezel and a chronograph display. It runs on a V175 Solar quartz movement that gives it up to 6 months power reserve and also has a hacking feature. This model also features a diver’s 200m water resistance rating. 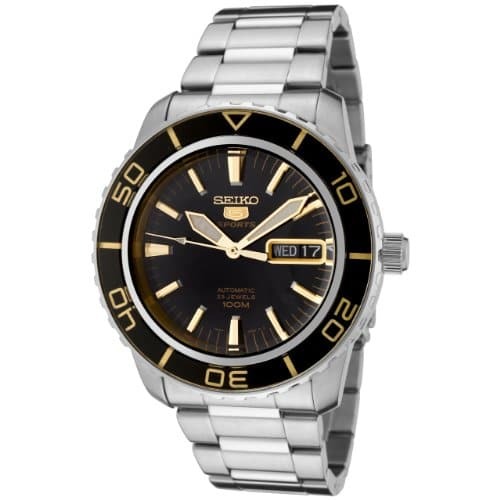 You may also find this watch referred to as the Seiko SSC019P1. If you like the look of this model but prefer rubber straps then you should check out the Seiko SSC031 instead. You can read my full Seiko SSC019 review here soon. This is a very large Seiko dive watch, it has a 47mm casing diameter along with a 14mm thickness making it quite a chunky diving watch. I love the smooth movement that the automatic 4R36 movement gives this watch moving at 6 ticks per second. The 24 jewel movement has a 41 hour power reserve and can be manually wound and hacked. This model is also listed as the Seiko SRP637K1. It’s ISO scuba diving rated with a diver’s 200m water resistance rated and comes with a brilliant coating of Lumibrite for easy reading in the dark. You can read my full Seiko SRP637 review here soon. 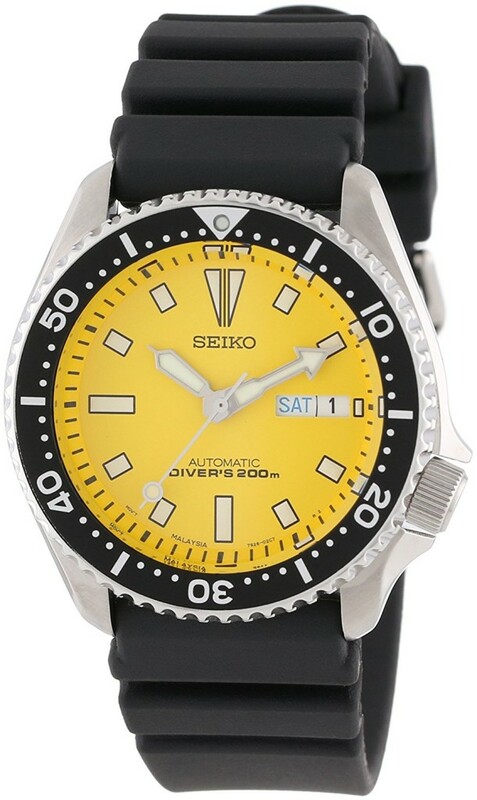 Up next in our list of the top Seiko diving watches is this bright yellow model, the Seiko SKXA35. This model runs on the 7S26 caliber 21 jewel automatic movement with a 43 hour power reserve. I like how much the yellow dial sticks out on the wrist, it reminds me of the Seiko Orange Monster to some degree. 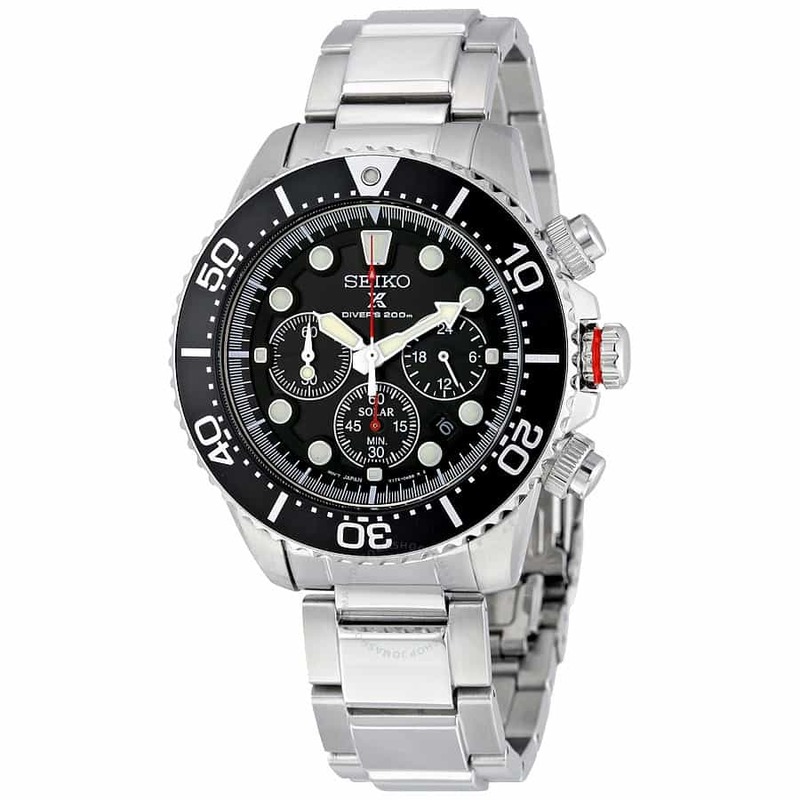 This model also features a diver’s 200m water resistance rating which has the ISO rating for scuba diving. You can read my full Seiko SKXA35 review as soon as it’s available. This model is often found referred to as the Seiko SSC021P1. It’s a Seiko solar quartz diving watch meaning it uses the power of light to charge itself and run a quartz movement, it never requires a battery which is one of the biggest benefits to these types of watches. The Seiko Solar chronograph has a diver’s 200m water resistance rating as well as a generous coating of lume on the hands and hour markers. This model also made it onto our ultimate 33 best dive watches for men. You can read my full Seiko SSC021 review here once it’s ready. 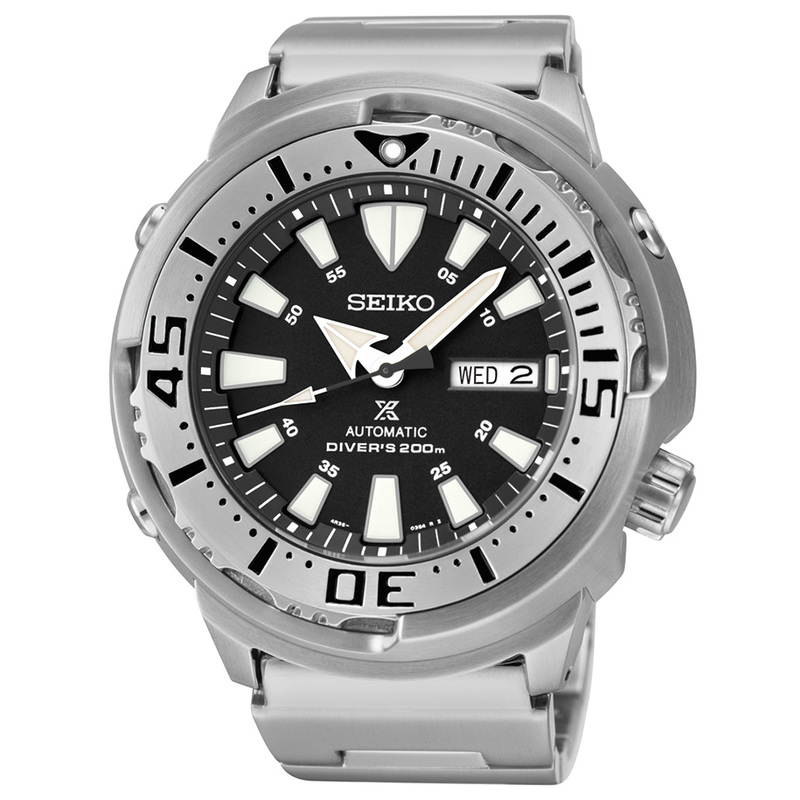 Another very in demand Seiko dive watch is the Seiko SKZ211 known as the Land Shark, Atlas, and Gadget. It’s from the Seiko 5 series and features an inner bezel with compass directions. It’s a hefty watch with a solid bracelet and features the 7S36 automatic movement at its heart. You can read my full Seiko SKZ211 review here soon. 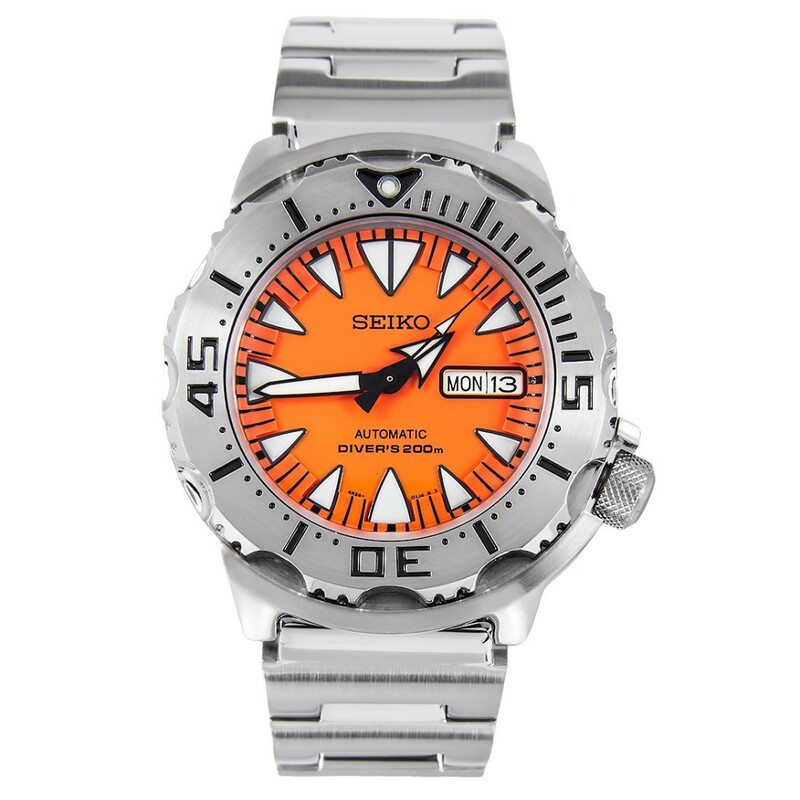 Up next we have the extremely recognisable and very popular Seiko Orange Monster. The Seiko SRP309 is a 2nd generation Orange Monster and features this instantly recognisable bright orange dial which gives it the name. This model can be a little hard to come across these days so if you manage to find somewhere make sure you mention it in the comments section below. The Seiko Orange Monster runs on a 4R36 automatic movement, this is a 24 jewel movement with a 41 hour power reserve. It also features manual winding as well as hacking. It beats at 21,600 BPH give you a smooth 6 ticks per second movement. You can read my full Seiko SRP309 review as soon as it’s available. Earlier on we took a look at the Seiko SSC019 at number 12, this model the Seiko SSC031 is the rubber strapped variant of that Seiko diver. It also features a chronograph dial as well as the popular Seiko Pepsi bezel. 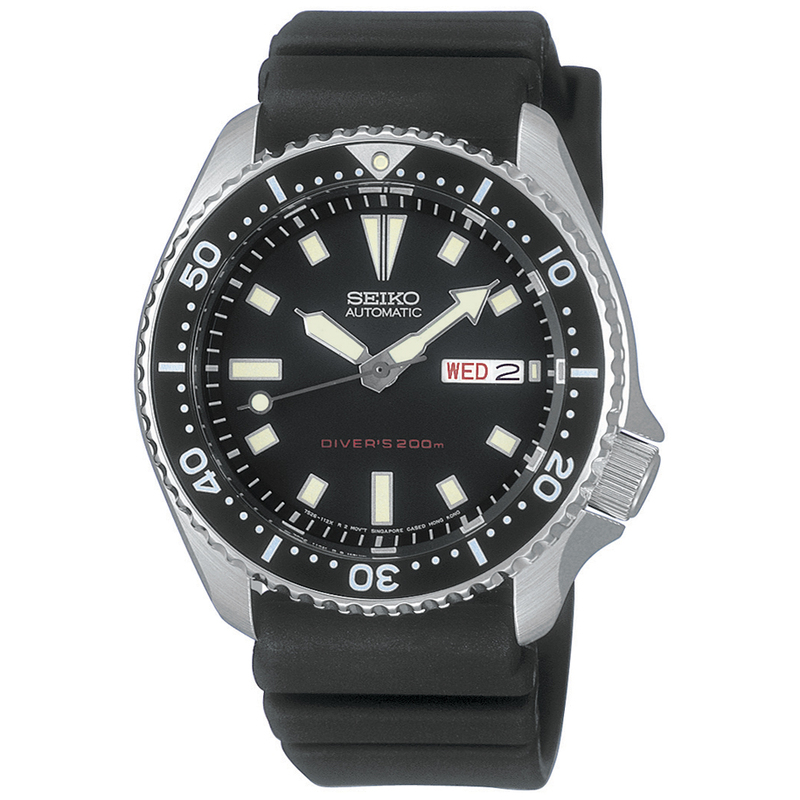 This is another popular Seiko Solar dive watch and features a diver’s 200m water resistance rating. You can read my full Seiko SSC031 review here once it’s ready. This is the Seiko SKX031 which is also known as the Seiko Submariner. 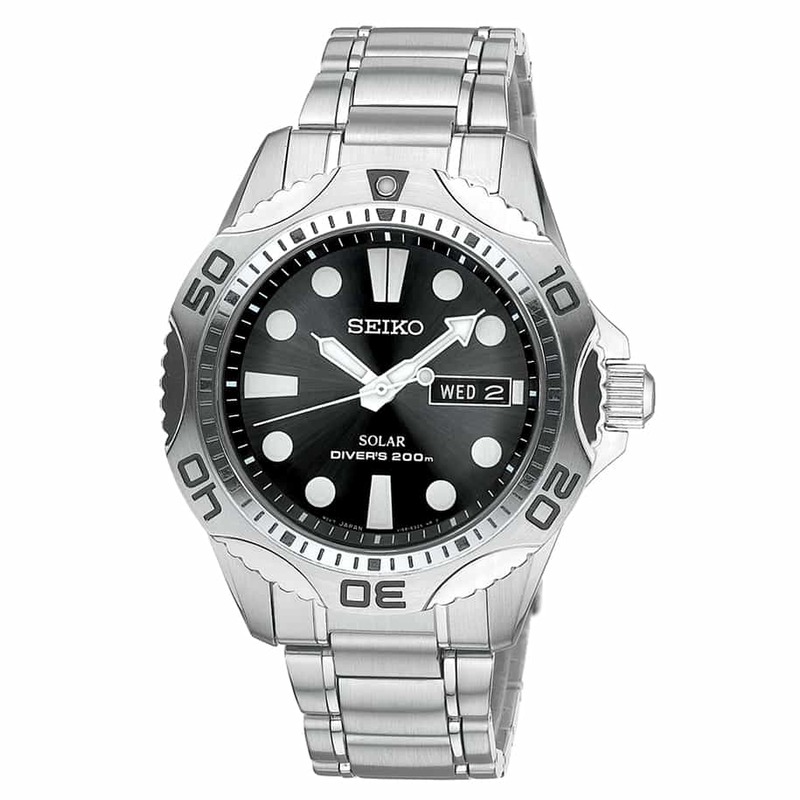 It’s another top Seiko diving watch that runs on the 7S26 automatic movement. It’s a little different to see the 100m water resistance rating to be displayed in the manner that it is on the dial of this timepiece. In the future, you’ll be able to read my full Seiko SKX031 review here. Here we have a popular Seiko solar dive watch which powers itself using light be it natural or artificial and never requires a battery change. Those of you that have had to have a battery replaces on a diving watch before will know that it’s a nice little saving. The Seiko Solar SNE107 runs on a V158 solar powered movement and features a high quality diver’s 200m water resistance rating. You can also find this model with a rubber strap if you prefer, it’s the Seiko SNE107P2. You can view my full Seiko SNE107 review here soon. 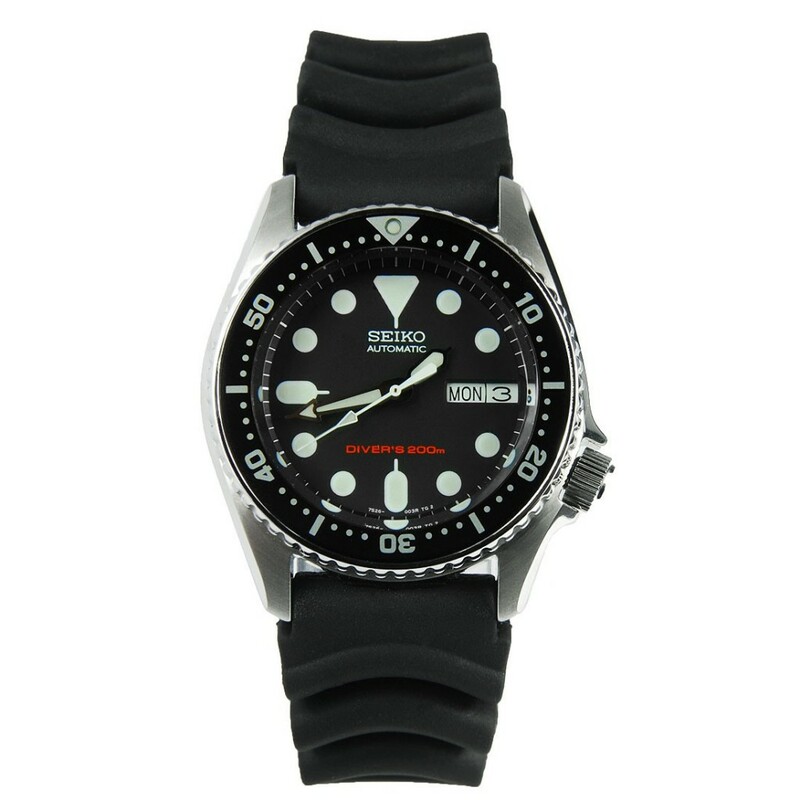 You’ll commonly find this model referred to as the Seiko SNZH57K1 or SNZH57K. It’s part of the very popular Seiko 5 collection which aims to offer a wide selection of affordable automatic watches. 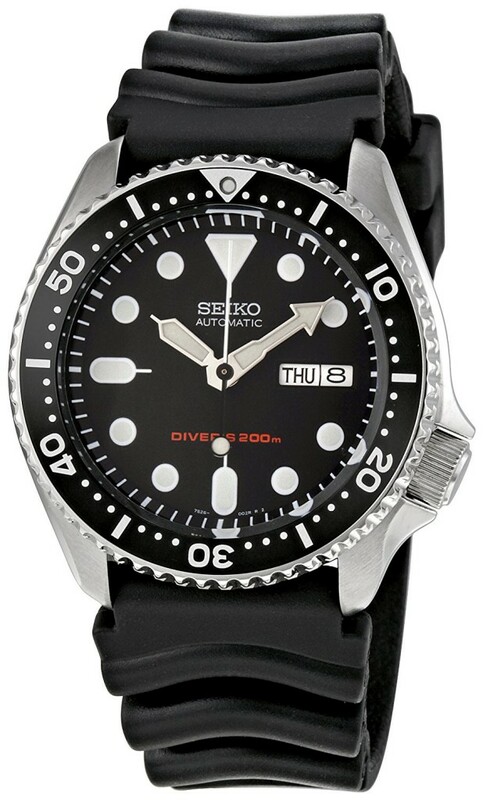 Obviously, it’s great to see a Seiko 5 diver’s watch on offer. The Seiko SNZH57 runs on a 7s36 automatic movement and has a 100m water resistance rating. This type of model is suitable for shallow diving and wouldn’t be recommended for scuba diving, the crown does not screw down. Check out my full Seiko SNZH57K1 review soon. Here we have the well-known Seiko Tuna or Seiko SUN021 Prospex. This is a Seiko Kinetic Diver’s watch that runs on a 5M85 Kinetic Quartz movement. It has a 6 month power reserve, features hacking but not manual winding. 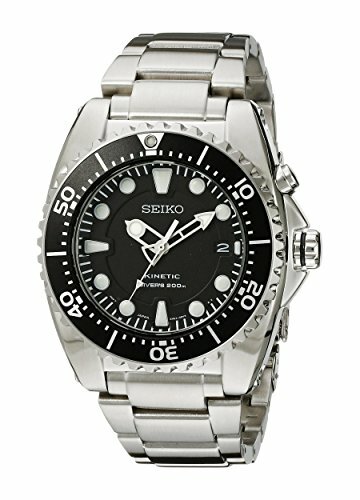 Overall the Seiko SUN021 or Seiko SUN021P1 as you may see it referred to as, is a higher end Seiko diving watch, it has a diver’s 200m water resistance rating, a sapphire crystal glass for excellent scratch resistance, and a GMT hand complication. 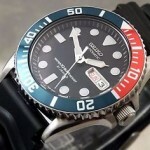 If you’re after a Seiko GMT diver then it’s well worth looking into this model. You can read my full Seiko SUN021 review here once it’s complete. 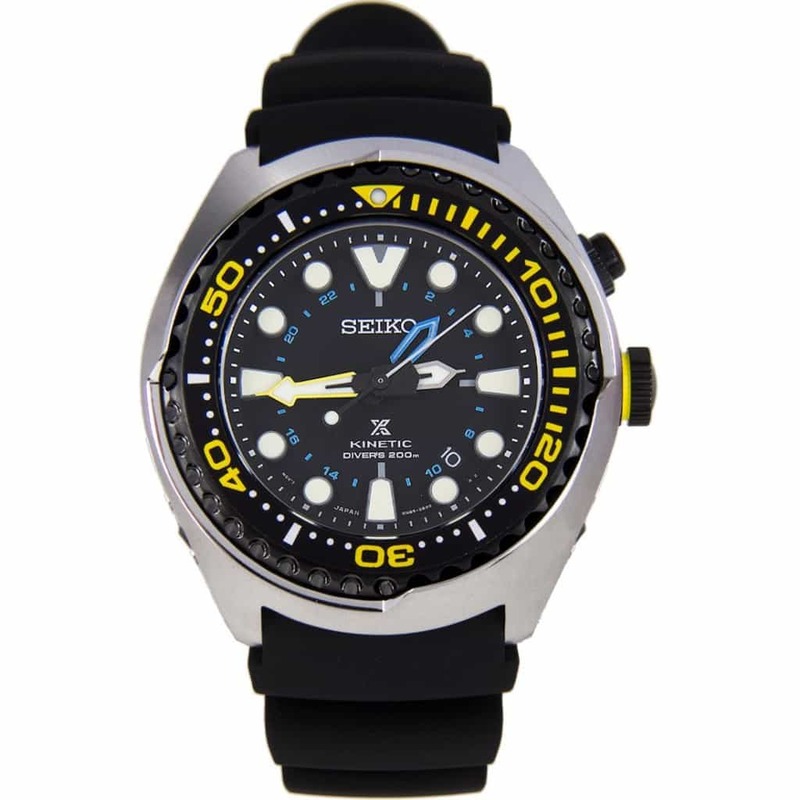 Next up we have another popular Kinetic diving watch from the Seiko Prospex line. You’ll spot this listed as the Seiko SKA371P1 or Seiko SKA371 in most cases. This model runs on a 5M62 caliber kinetic quartz movement that has a 6 month power reserve, features hacking but no manual winding. It also has a very decent diver’s 200m water resistance rating. If you like larger diving watches that run on a kinetic movement then this 45mm model may be ideal for you. You can read my full Seiko SKA371 review here as soon as it’s available. For those looking for a Seiko chronograph diving watch the SSC015 would prove a high quality choice. It’s also referred to as the Seiko SSC015P1 and is part of the Prospex selection. This model runs on a Seiko V175 solar quartz chronograph movement that has a 6 month power reserve and has a hacking feature. It’s rated up to diver’s 200m water resistance rating which is excellent too. You can read my full Seiko SSC015P1 review once it’s complete. 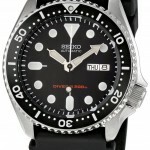 Finishing up our list of the best Seiko dive watches is the Seiko SBDC001, otherwise known as the Seiko Sumo. It’s another Seiko Prospex watch with an impressive Scuba 200m water resistance rating. This Seiko Sumo runs on a 6R15 automatic movement. It features 23 jewels and has a very good 50 hour power reserve. The watch features both manual winding and hacking. This movement runs at 21,600 BPH giving it a really smooth 6 ticks per second. You can read my full Seiko Sumo review here soon. I’d like to say a massive thanks for taking the time to have a read through today’s list of the top 25 best Seiko diving watches for men. There’s a wide range of movements to pick from so if you prefer quartz dive watches or automatic diver’s then there should be something for everyone. Let me know what your favourite Seiko diver was in the comments section below.